Baguio is know for its cool weather and La Trinidad, Benguet Strawberry Farm otherwise is known for its freshly picked strawberries of assorted sizes and sweetness. This year, the 3 of us finally got the chance to visit the Strawberry Farm as it is part of the top must visit places in Baguio when people flock to experience the cool breeze and fog late afternoon and early morning sun. The 3 of us got to Baguio so very early at 4:30 AM and got our accommodation for a cheap transient house somewhere in Marcos Hiway near the entrance to the City of Pines – Ferionni. Our first reservation which failed was supposed to be at Lyn’s Transient House due to change of time arrival and travel of the family. As a first timer in the place, my advantage was that my parents, Tatay Sam and Nanay Ana had been there last year so tatay was able to prepare for an itinerary for a swift and smooth tour around Baguio. They visited Baguio while I was in Japan and since most of the media taken for me this year was a video while picking fresh strawberries in the farm, I decided to use photos from last year’s escapade and will be posting an update as soon I edit the videos taken while me and nanay are picking fresh berries at the farm. I was not there in the picture but I must admit, this year, the weather of Baguio is comparable to that of Japan while I was in Tokyo with my Tita Beng, DJ and Katrina, my cousins. I couldn’t imagine that I can find such a nice place with cool weather in the Philippines although there were new articles and blogs written for this amazingly majestic fogged place especially when we went to the farm to buy fresh berries. There are lots of people from Korea, Japan, China and other places in the world who come to retire to the Philippines and opt in to buy a house in Baguio. Others go for Tagaytay which is a little bit less cold than Baguio is. How Much Are Strawberries at the Farm? We took 2 trips to the farm. 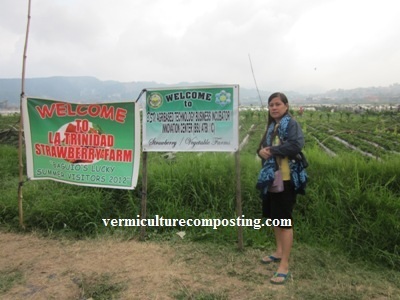 One is to get in touch and bond with the natural cool weather and get the feel of La Trinidad and buy some fresh strawberry that we personally picked. The price though was costly if you opt in to pick your own harvest. Buying at the strawberry stalls out of the farm will only reveal a very cheap and affordable price of Php 50.00 pesos / kilo for the smaller sized berries while the big ones would cost you from Php 70.00 – Php 100.00 per kilo. 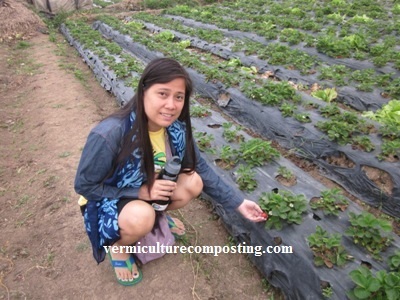 On the other hand, just to inform you and be ready to enjoy the picking spree as you wish, the price would cost you Php 250.00 – Php 300.00 pesos a kilo for freshly picked sweet and full of live beneficial enzymes strawberries. If you ask me, I say the price is worth the trip and the picking. The second time we went there is to buy mother plant to bring home to Manila from Baguio and to buy pasalubong strawberries to take home. We also bought strawberry jam, ube jam and other stuff there but the main purpose is to buy runners or mother plant to take home in Caloocan and Cavite house. As an advice, if you want to go pick your own berries, try to go down the farm first and see the fruits for yourself. Don’t opt in to pick at once where you were offered a price. Go around. It is absolutely and 100% free to walk along the isle of the farm and visit the whole area for as long as you wish. Another tip is to let you know that the farm is not owned by only one person or strawberry seller. Different acres and were owned and managed by different owners and caretakers offering you to buy and pick your own produce. Therefore, it is but better to take a look and see first for yourself which part of the farm had more ripe red and juicy big looking strawberries before buying a picking spree at the price I have revealed above. From an observation, I noticed that many people opt in to pick from the part of the farm nearest to the highway entrance. Those that the eyes can easily feast of and while the excitement drives you nuts to go pick at once. Wait! Again, consider taking a peek at other faraway parts of the farm where very few people would opt in to buy and pick their own strawberries. Those far places were rarely visited which means that chances are, they have the best offer you can get. Chances are, they have cheaper price and better produce there and so much choice to pick only the red blood colored and ripe sweet and soury taste stawberries. It is best to go for those kinds of areas unless you are not interested to walk under the heat of the sun. Yes, although the air is cool, the heat of the sun is what most people hate. But you can always bring your umbrella to remedy that problem. Picking time must be early in the morning. Strawberries do ripen easily which means that over the afternoon when nobody is picking there anymore, the next morning would be the best option for your to go picking and buy a picking spree. Suggested picking time if you want to be the first to get the best tasting strawberries is from 7:00 AM to 10:00 AM only. Avoid going farther than these time ranges or you’ll be dealth with the leftovers or else, you’re gonna have to buy from the picked ones at the stalls which is by the way cheaper but with less the fun of picking and getting to choose your own produce and eating only the best choices of berries. Don’t come to pick strawberries at the farm when it rained. You definitely can’t go down to pick or you’ll have to wear boots which by the way are for rent if you insist on picking fresh berries to take home or eat. Another option is to just buy from the stalls. When it’s muddy, you won’t enjoy the picking trying to worry much for your foot not to get caught by deeply wet mud. 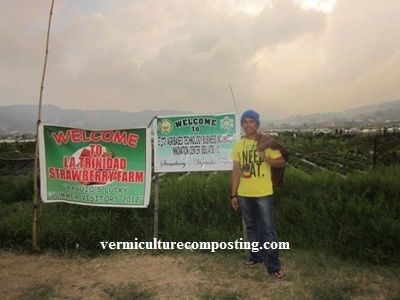 Now that I have revealed the tips above if you are also looking to visit The Strawberry Farm in La Trinidad, Benguet, I hope to be able to have helped you if get to this article. Please do share this page using your social media accounts below. Return the favor in your own small way. Thank you for visiting our family’s blog.